Storey Publishing, LLC, 9781612129907, 192pp. 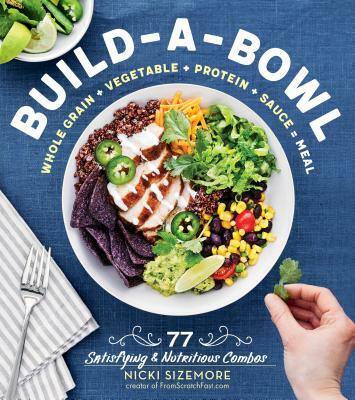 Build-a-Bowl is a fun and healthy way to put good food on the table! Popular food blogger and teacher Nicki Sizemore’s fuss-free method starts with a grain base, whether it’s a popular favorite such as brown rice or an ancient grain like farro. Add a layer of fresh vegetables and herbs, follow that with a lean protein, and then finish it off with a flavorful sauce for a delectable super-powered meal. Sizemore’s 77 creative combinations range from the Chicken Sausage Meatballs Bowl to the Crispy Fish Taco Bowl and the vegan-friendly Double Broccoli Power Bowl. Suitable for breakfast, lunch, or dinner, the beauty of the bowl is that every combination can be customized, making it a perfect solution for feeding everyone at the table with their favorites — happily and easily.